Twinners cutting the cake at the 25th anniversary celebration of the twinning of Maybole and Crosne held the last weekend of September 2007. Click on the images below to view full size and the links at the bottom of the page for other Maybole - Crosne events. 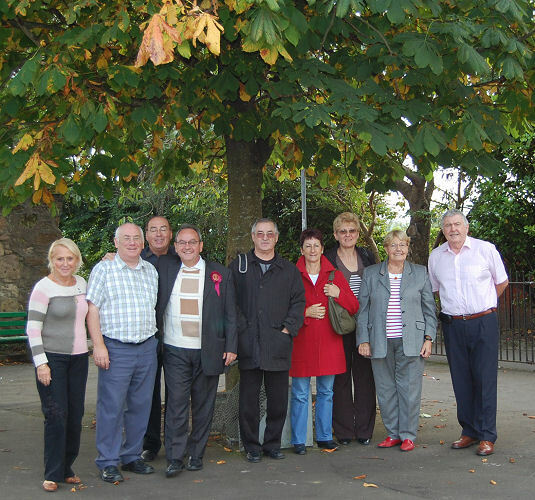 Maybole celebrated 25 years of twinning with the French town of Crosne at the weekend. 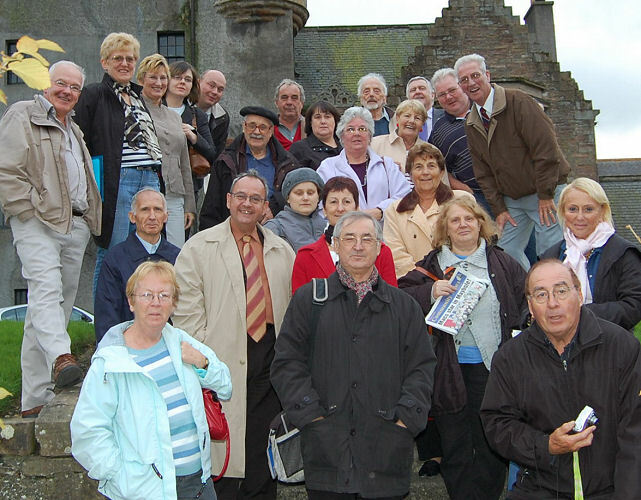 Mayor Alain Girard led a party of 15 Crosnois who arrived last Friday afternoon and they were welcomed at a small reception in Maybole Castle. 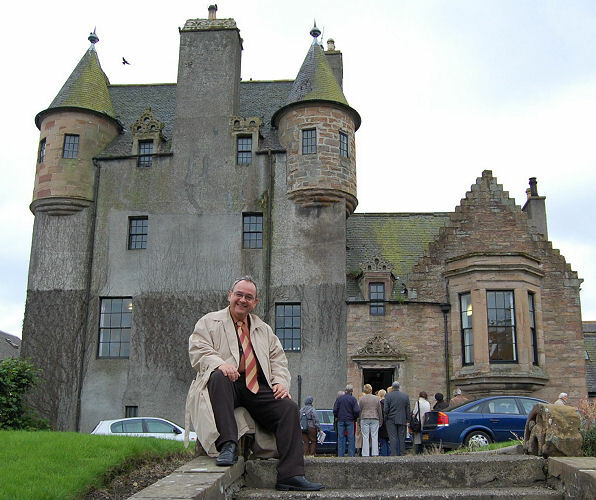 After a few short speeches the visitors were treated to a talk on the history of the castle and a conducted tour by Murray Cook, President of the local Historical Society. On Saturday morning the twinners headed for Culzean Castle and a then toured the area before heading back to Maybole. 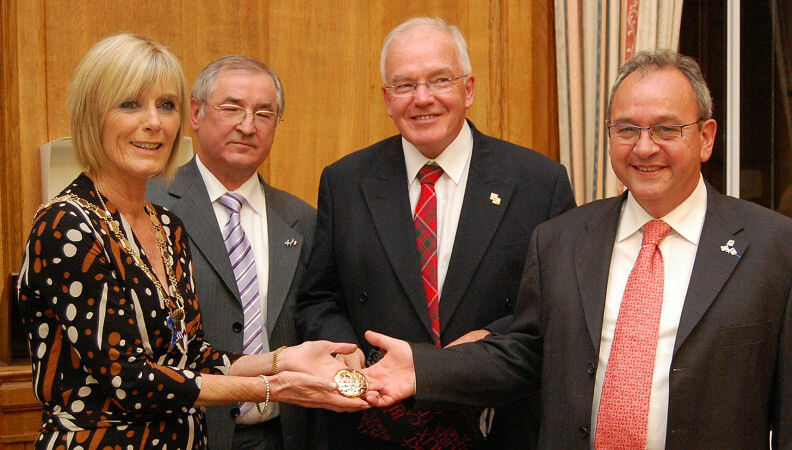 In the evening they were special guests at a civic reception hosted by Provost Winifred Sloan in the County Buildings. The provost welcome everyone saying, “As Provost of South Ayrshire Council I am delighted and very honoured to welcome our local guests and our friends from France to County Buildings today to celebrate the Silver Anniversary of the Maybole - Crosne town twinning. Back in 1982, David Kiltie, Alan Murray, Jim Sym and Don Raby had made the first visit to Crosne and later that year the twinning arrangements were complete. So much has happened since then, it hardly seems that a quarter of a century has gone by. It is almost impossible to know where to start, but I am certain of one thing. 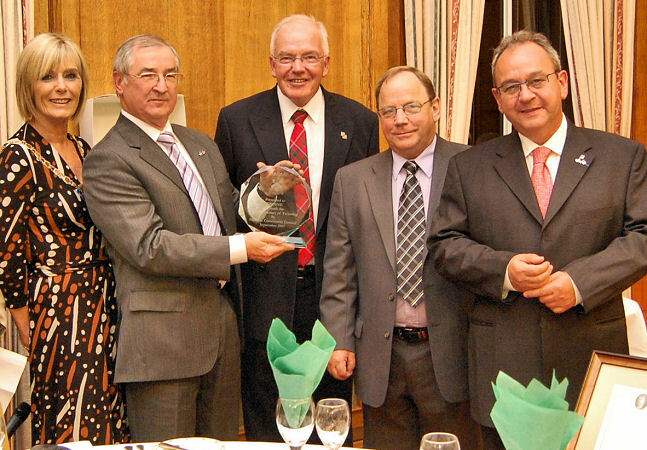 No town twinning can celebrate twenty-five years of continued success without hard work, commitment and, most importantly, a spirit of willingness and friendship from both sides. Even though both towns are in different countries and are hundreds of miles apart, there's still a real sense of community here today and that can only come from the continued shared co-operation, collaboration and experience between friends. I know that during that time some of those who put in the work on both sides have moved on - or passed away - and, once again, their efforts were key in laying the foundations for the Silver Anniversary celebrations of this weekend. Tonight I hope that many friendships are renewed, are created and maintained. Twenty-five years from now, it would be wonderful if South Ayrshire was welcoming friends from Maybole and Crosne's Twinning Associations in celebration of their golden anniversary. It is also my great hope that I will be here to see it! I warmly congratulate all those who had the foresight and the drive to set up the town twinning initiative and those who have worked so hard to maintain it. Long may it continue. Replying, William Grant, chairman of Maybole Town Twinning Association, said, “First of all I would like to thank Provost Sloan for her kind and sincere words. Tonight we are gathered here in this magnificent building as part of the celebrations of 25 years since we first signed our twinning agreement with Crosne away back in 1982. As the provost said an initial visit was carried out a year earlier in 1981, with representatives from Maybole visiting Crosne and later in that year representatives from Crosne were visiting Maybole. Of these groups it’s good that of the original visits Alan Murray, David Kiltie, Philippe Laug, Marylène Laug and Christine Vignot are here tonight. 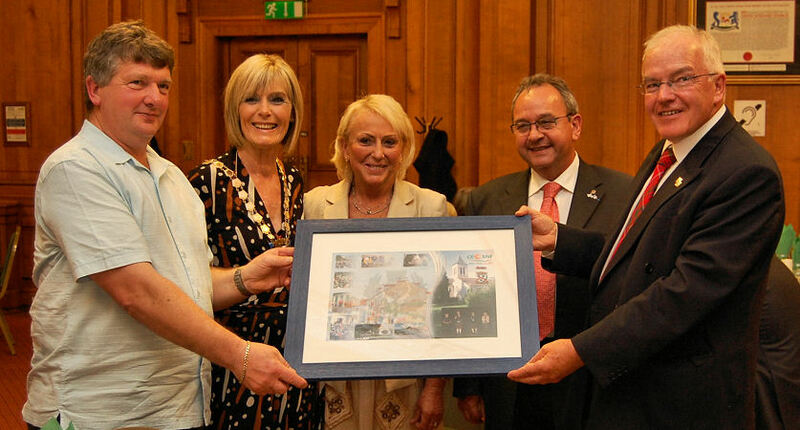 We all agree those involved at the beginning made an excellent choice of a twinning link. In all this time we have shared many happy memories, arranged many visits, and in Maybole we have organised the “Tour de Jumelage” four times during this period. We will also arrange the joint twinning meeting in 2008. 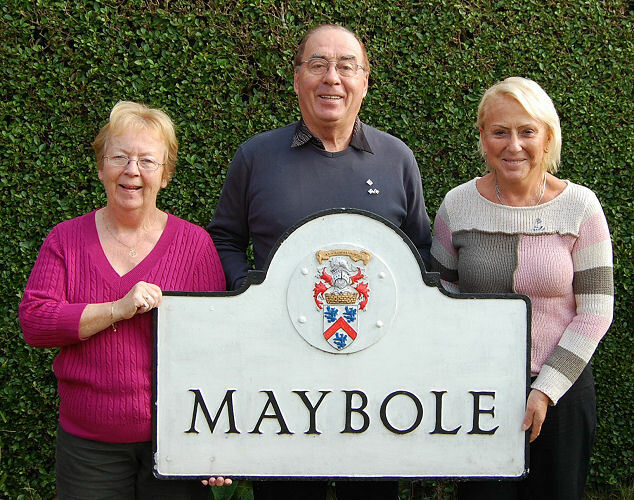 To arrange these successful events whether in Maybole or Crosne takes a lot of hard work and we sincerely thank those who have worked for the twinning between Maybole and Crosne. I especially thank those who have been or are Vice Chairmen, Secretaries, Treasurers and committee members, without their dedication it would not have been possible. Twinning of course would never happen unless people are willing to host and provide hospitality, a great thank you is owed to these people. 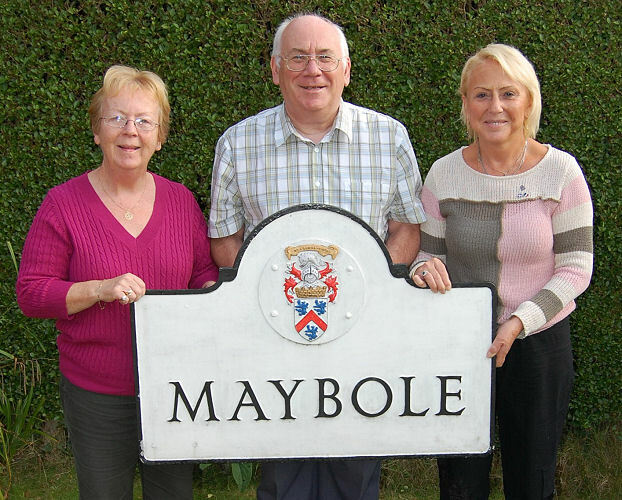 On a personal basis I would like to thank the twinning of Maybole for allowing me to be Chairman for the last 16 years. At this time we remember our fellow twinners who sadly are no longer with us. Twinning can fulfill several of the most human needs, companionship, activity, adventure, curiosity. It is a means of understanding other people, their culture, lifestyle, food, language. You make new friends, sometimes for life, and are accepted into families Twinning towns is a wonderful way of bonding communities in long-term friendships as can be seen here tonight. This can be especially important for young people, for them, the twinning relationship offers an opportunity to broaden horizons as well as nurture important qualities such as openness and acceptance. It is indeed excellent that in the last two years we have managed to arrange school exchanges between Crosne and Maybole and we hope these will continue, building on the friendship that has been created between the schools Twinning has a future, but within that future we must see the introduction of fresh blood into our associations, we must help and support the building of the relationship between the schools of Maybole and Crosne, by achieving these it will enable us to look forward to another successful 25 years of twinning between Maybole and Crosne. We thank the Provost and South Ayrshire Council for granting this civic reception and for the continued support they have shown show for town twinning since its conception. Let us look forward to the next 25 years, and many more happy times to come. 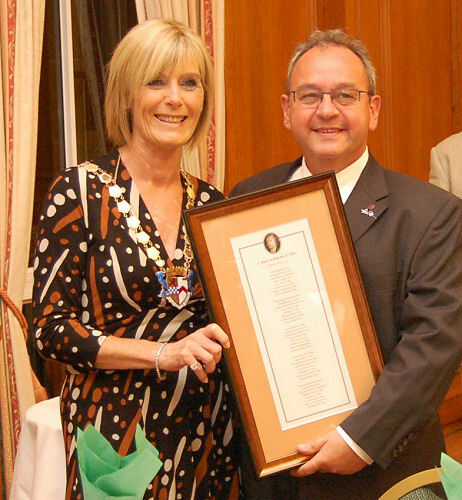 The Mayor of Crosne, Alain Girard, also replied saying, “Dear friends, I am happy today to be in Maybole to celebrate, here, with you, the 25th birthday of the twinning between Crosne and Maybole. “Indeed, 25 years ago, on September 20, 1982, our communes, represented by Michel Berson, Mayor of Crosne and David Kiltie, Chairman of Maybole, signed this oath of twinning, in order to build strong bonds between the inhabitants, in order to develop exchanges to grow by a better mutual comprehension, the feeling of European fraternity and to continue the tireless work for peace. Mr Bareth, former secretary-general of the Council of the Communities of Europe said: "a twinning is the meeting of two communities which intend to proclaim that they join to act from the European point of view, to confront their problems and to develop bonds of friendship". “From the very start, and before even the signature, since 1981, at the time when an official delegation had come here to celebrate "the engagement", true bonds of friendship were created between the inhabitants of our two communities. “Your culture, our common past which goes back to the "Old Alliance" helped bring us closer. “Demonstrations of twinning, European demonstrations we have realised together. I am proud that the school exchanges could begin again in 2006 and 2007. It is very important that our young people meet, know one another, appreciate each other, and I know that the children of the College Bellevue in Crosne have excellent memories of their visit to Maybole and the reception they received. “Twinnings, at their level, are an invaluable investment and the greatest force to build Europe. “Our twinning breaks the frontiers in order to build together a European society whose ethic is founded on only one principle, friendship and the major goal - peace. “I wish long life with our twinning in an interdependent Europe. “Long live the twinning, long live the friendship between our towns, long live Europe, long live peace.” Daniel Robin, chairman of the Crosne Twinning Committee added, “The Twinning Committee of Crosne is very happy to celebrate, once more, this 25th anniversary of relations between our towns. “In 2006 and 2007 there were many events in France and in Scotland. Our two colleges have taken up contacts, our children were very happy after meeting in June last year and March this year. There was the twinning tour in July last year and there was a special Scottish evening in Crosne in November. “During this year’s carnival in Crosne there was the fist part of commemorating the 25th anniversary of the twinning oath. “Needless to say, we will always be happy to welcome you and I hope there will be many meetings in the future. 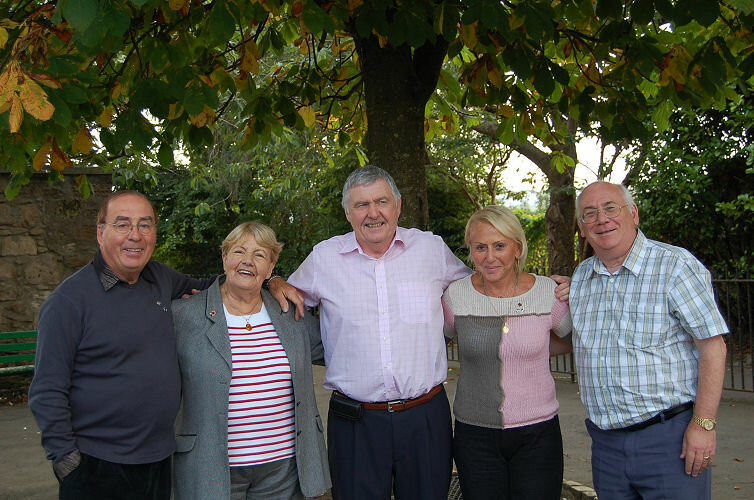 Long live European twinnings, long live French and Scottish relations.” On Sunday there was a get together in Carrick Sports Club for a buffet lunch before the French headed to Prestwick for their flight home.